Many intelligence agencies are turning to the use of smartphone malware and spyware for the purpose of hacking and surveillance. The list of such agencies includes but not limited to US CIA, NSA, Mossad, RAW, MI6, ISI and others. Global proliferation of cyber hacking tools appears to have been accelerated with the US CIA's loss of control of its hacking tools including spyware, malware, viruses and trojans. Lookout, an American mobile security firm based in San Francisco, has recently published a report claiming that a "group or individuals that are believed to belong to the Pakistani military "has developed and released a "set of custom Android and iOS surveillanceware tools we’re respectively calling Stealth Mango and Tangelo". The report says: "These tools have been part of a highly targeted intelligence gathering campaign we believe is operated by members of the Pakistani military". The countries affected by it include Afghanistan, India, Iraq, Pakistan and the United Arab Emirates, according to Lookout report. The targets in Pakistan include members of the foreign diplomatic corps who have visited conflict zones, particularly parts of Balochistan, and Pakistani officials involved in internal corruption investigations. "Stealth Mango and Tangelo is yet another example among the numerous campaigns we have uncovered (Dark Caracal, ViperRAT, FrozenCell, etc.) where threat actors are developing in-house custom surveillanceware. The actor behind Stealth Mango has stolen a significant amount of sensitive data from compromised devices without the need to resort to exploits of any kind. The actors that are developing this surveillanceware are also setting up their own command and control infrastructure and in some cases encountering some operational security missteps, enabling researchers to discover who the targets are and details about the actors operating it that otherwise are not as easily obtained. Relevant data has already been shared with the appropriate authorities. Lookout customers are protected against Stealth Mango and Tangelo and have been for several months since the beginning of the investigation." Amnesty International has alleged that attackers are using fake online identities and social media profiles to "ensnare Pakistani human rights defenders online and mark them out for surveillance and cybercrime". The report titled "Human Rights Under Surveillance: Digital Threats against Human Rights Defenders in Pakistan" claims that Diep Saeeda, a Lahore-based human rights activist, has been targeted by a "network of individuals and companies based in Pakistan that are behind the creation of some of the tools seen in surveillance operations used to target individuals in Pakistan". Amnesty says that "over the course of several months, Amnesty International used digital forensic techniques and malware analysis to identify the infrastructure and web pages connected to online attacks on human rights activists in Pakistan". "Amnesty International’s Technology and Human Rights team has been able to trace these attacks to a group of individuals based in Pakistan". In 2017, Wikileaks revealed that the American intelligence agency CIA has "lost control of the majority of its hacking arsenal including malware, viruses, trojans, weaponized "zero day" exploits, malware remote control systems and associated documentation." The Wikileaks noted that that "the CIA made these systems unclassified". Wikileaks said: "In what is surely one of the most astounding intelligence own goals in living memory, the CIA structured its classification regime such that for the most market valuable part of "Vault 7" — the CIA's weaponized malware (implants + zero days), Listening Posts (LP), and Command and Control (C2) systems — the agency has little legal recourse". FBI agents have since arrested 29-year-old former CIA software engineer Joshua A. Schulte as a prime suspect in the release of the CIA documents via Wikileaks, according to New York Times. It appears that the CIA's "hacking arsenal" is now being modified and used by many state and non-state actors to carry out hacking and surveillance of their targets around the world. The proliferation of cyber hacking tools appears to be a lot easier than the proliferation of the nuclear weapons technology. A report by American mobile security software vendor Lookout claims that individuals and groups connected to the Pakistani military are using spyware and malware tools on targets in Afghanistan, Pakistan, India and UAE. Amnesty International alleges that Pakistan intelligence agencies are "network of individuals and companies based in Pakistan that are behind the creation of some of the tools seen in surveillance operations used to target individuals in Pakistan". Many intelligence agencies are turning to the use of smartphone malware and spyware for the purpose of hacking and surveillance. The list of such agencies includes but not limited to US CIA, NSA, Mossad, RAW, MI6, ISI and others. Global proliferation of cyber hacking tools appears to have been accelerated when the US CIA lost control of its hacking tools including malware, viruses and trojans. What If Musharraf Had Said NO to US After 911? Pakistan government’s Cyber Security Centre has been inaugurated at Air University in Islamabad to deal with cyber security challenges in the digital age. Faaiz Amir informed that Air University is also commencing a four year BS cyber security programme, which is designed to develop modern cyber security skills and apply them to manage computers, systems, and networks from cyber-attacks. The programme would increase the awareness and knowledge about cyber security in Pakistani students, he added. Cyber security encompasses technologies, processes and controls that are designed to protect systems, networks and data from cyber attacks. Pakistan’s Cyber Security Centre aims to develop advanced tools and research technologies to protect Pakistan’s cyberspace, sensitive data, and local economy from the cyber-attacks. The headquarter of the National Centre for Cyber Security will be based at Air University Islamabad with labs at different universities of Pakistan including Bahria University Islamabad, National University of Science and Technology (NUST), Information Technology University Lahore (ITU), Lahore University of Managment Sciences (LUMS), University of Peshawar, University of Engineering and Technology Peshawar, University of Nowshera, Pakistan Institute of Engineering and Applied Sciences (PIEAS), NED University Karachi, University of Engineering and Technology Lahore and University of Engineering and Technology Taxila. Cyber-attackspose an enormous threat to the national economy, defence and security, National Security Adviser, Nasser Khan Janjua, earlier said. After repeated calls from experts to secure the cyber space, Pakistan government has finally launched the centre to protect the cyberspace, sensitive data, and local economy from the cyber-attacks. Last week, country’s National Counter Terrorism Authority (NACTA) also established a cyber security wing on modern lines to evolve cyber security strategies and to meet emerging cyber terrorism threats. The Reconnaissance General Bureau, North Korea’s equivalent to the CIA, has trained up the world’s greatest bank-robbing crews. In just the past few years, RGB hackers have struck more than 100 banks and cryptocurrency exchanges around the world, pilfering more than $650 million. That we know of. It was among the greatest heists against a United States bank in history and the thieves never even set foot on American soil. Nor did they target some ordinary bank. They struck an account managed by the Federal Reserve Bank of New York, an institution renowned for its security. In vaults 80 feet below the streets of Manhattan, the bank holds the world’s largest repository of gold. Many of these gold bars belong to foreign governments, which feel safer storing their gold inside well-defended bunkers in America than at home. By the same token, overseas governments also store cash with the Fed. But this is cash in the 21st-century sense: all ones and zeroes, not smudgy bills. The bank holds vast foreign wealth on humming servers wired up to the internet. That’s what the thieves went after in February 2016: nearly $1 billion, sitting in a Fed-run account. This particular account happened to belong to Bangladesh. Having already hacked into the servers of the Bangladesh Central Bank, the criminals waited until a Friday — a day off in many Muslim-majority nations, Bangladesh included. Then they started draining the account. Posing as Bangladesh Central Bank staff, the hackers sent a flurry of phony transfer requests to the Fed totaling nearly $1 billion. The Fed started zapping cash into accounts managed by the thieves overseas, most of them in the Philippines. Much of the money was quickly pulled out as cash or laundered through casinos. From there, the trail goes cold. The hackers didn’t get the full billion they desired. Most of the bogus requests were caught and canceled by suspicious personnel. But they did end up with an amazing score: $81 million. The culprits of this heist are loyal to one of the most impressive organized crime syndicates in the world. They don’t work for the Triads, nor the Sinaloa Cartel, nor Sicily’s Cosa Nostra. They are agents of the Reconnaissance General Bureau (or RGB), which is headquartered in Pyongyang. This is North Korea’s equivalent to the CIA. Like the CIA, North Korea’s RGB is steeped in clandestine overseas plots: assassinations, abductions and lots of spying. But it is perhaps better understood as a mash-up between the CIA, the KGB and the Yakuza. What distinguishes the bureau is its entrepreneurial streak — one with a distinctly criminal bent. For decades, North Korea has been beleaguered by Western sanctions and barred from global markets. This has prodded the regime to seek revenue in darker realms that are beyond the law. These black-market enterprises have included heroin production, printing bogus $100 bills and counterfeiting name-brand cigarettes. But all of those rackets have now been totally eclipsed by hacking. The bureau has trained up the world’s greatest bank-robbing crews, a constellation of hacking units that pull massive online heists. These thieves also have one distinct advantage over other syndicates: They are absolutely confident that they’ll never be charged. So it goes when your own country sponsors your criminal mischief. This is a new phenomenon, according to US intelligence officials. “A nation state robbing banks … that’s a big deal. This is different,” says Richard Ledgett. He was, until his recent retirement, the deputy director of the National Security Agency. New York, June 5, 2018--The Committee to Protect Journalists today condemned comments from Major General Asif Ghafoor, spokesperson for Pakistan's military and intelligence agencies, who accused journalists of sharing anti-state remarks on social media. At a press conference yesterday, Ghafoor derided the rise of social media troll accounts, which he said spread propaganda against the army and state, and said that Pakistan's spy agency, the Inter-Services Intelligence (ISI), was monitoring such accounts and those that engage with them, including journalists. During his presentation, Ghafoor showed a graphic featuring an alleged troll account's Twitter activity and the journalists and other individuals allegedly connected to the account, who, Ghafoor said, redistributed anti-state and anti-army propaganda from the troll's account. The journalists featured on the graphic include Ammar Masood and Fakhar Durrani, both with media Jang Media Group, Umar Cheema from the Jang-owned daily The News, Azaz Syed from the Jang-owned broadcaster Geo TV, and Matiullah Jan with the broadcaster Waqt News. Cheema received CPJ's International Press Freedom Award in 2011. "Displaying photos of journalists alleged to help push anti-state propaganda in Pakistan is tantamount to putting a giant target on their backs," said Steven Butler, CPJ's Asia program coordinator in Washington, D.C. "General Ghafoor should apologize for his comments and explain how security forces might help promote journalist safety in Pakistan, where reporters and editors are routinely threatened, attacked, and killed for their work." Pakistani authorities have cracked down on press freedom ahead of national parliamentary elections scheduled for July 25. 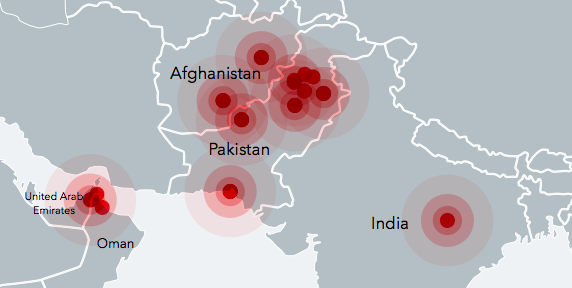 Recently, CPJ documented disruptions to the distribution of Dawn newspaper and access to television channel Geo TV. At IDEAS 2018, a Document of Understanding (DoU) was signed by STM and Pakistan Air University under the leadership of the Presidency of Defence Industries (SSB) of the Presidency of Rebuplic of Turkey. With this agreement, STM will provide significant solutions in integrated cyber security, big data and IT domains. STM SavunmaTeknolojileriMühendislikveTicaret A.Ş. expands its business in Pakistan. Following the cooperation in naval programs under the leadership of the Presidency of Defence Industries, it now moves to different areas. The signing ceremony was held with the participation of Mustafa Murat Şeker, SSB Vice President; Murat İkinci, STM General Manager; Air Vice Marshal Faaiz Amir, Vice Chancellor of Pakistan Air University; and officials. The agreement will increase the cyber security capabilities of Pakistan Air University, which sets up cyber security strategies of Pakistan and is responsible for the establishment of Pakistan’s National Center of Cyber Security (NCCS). STM will organize special training and internship programs in cyber security and IT for Pakistan Air University students and faculty; organize international conferences and workshops; give consultancy to research projects in graduate programs; and support the infrastructure for the establishment of the National Cyber Security Center (NCCS) at the university. This agreement aims to increase the national cyber security capabilities of the friendly country Pakistan thanks to STM's integrated cyber security efforts and capabilities. MARTIN: Tell us more about these allegations, and what do we know about the Saudi dissident making them? ESTRIN: His name is Omar Abdulaziz. He tells a very compelling story. He's a social media activist. He's a critic of the Saudi royal family. He lives in Montreal. And in his lawsuit, he says Saudi officials in Canada met him in May, told him Crown Prince Mohammed bin Salman was unhappy with his activism. They asked him to come to the Saudi consulate for further discussion, and he declined. And he says that he and Jamal Khashoggi started working together on an initiative to organize a group of Twitter activists against the Saudi regime. And then this dissident got a text message with a link, supposedly a DHL package delivery, and he clicked on the link and later, a Canadian group, Citizen Lab, said it believed that he fell victim to a cellphone spyware from an Israeli-based company, NSO. He spoke with NPR's Shannon Van Sant, and he said he thinks the Saudis intercepted his Whatsapp text messages with Khashoggi, and that was a deciding factor that led to his death. Here's what he said. OMAR ABDULAZIZ: For sure, the conversations between us played a major role in what happened to Jamal. And they found out what we were working on and what are these projects and why Jamal was behind them. MARTIN: What do we know about this company that makes the spyware? ESTRIN: NSO is its name. It's a very secretive company. It doesn't have a website. It was founded by three Israelis. Their first names form the initials NSO. And there are Israeli reports that the company recently sold its spyware technology to Saudi officials. The company defends itself. It says its products are only sold to governments and to law enforcement to fight terrorism and crime, but Israel is actually involved in this company in that Israeli government officials have to give the OK to let it sell its products abroad. This company has faced a lot of controversy. Mexican human rights activists and others say Mexican government officials hacked into their phones using this company's spyware - same accusations from a human rights activist in the United Arab Emirates. Amnesty International also says the software was used against one of its employees, and Amnesty is accusing Israel of allowing the spyware to be sold to regimes that violate human rights. MARTIN: Well, considering the company's connections to the Israeli government, is the suit likely to go anywhere? ESTRIN: It seems like it's more of a symbolic lawsuit, Rachel, to draw public attention to this issue. I think it's going to be hard to prove these claims in court, and the Israeli Defense Ministry has constantly defended its vetting of NSO technology sales abroad. And I should add that Israel is not the only place in the world where companies are developing spyware technology, but it is - Israel is a big player in the field. MARTIN: And presumably, Saudi officials aren't weighing in on whether or not they actually bought this technology, confirming any connection. ESTRIN: They're not, and it's very interesting. Saudi and Israeli ties are kind of under the radar, but this may be an example of some of those ties.